Over the coming decade, the home improvement market will increasingly rely on older homeowners to generate growth. A previous post pointed out that baby boomers will continue to control a large segment of the housing stock nationally, that they have low mobility rates, and that they have continued to improve their homes as they prepare to age in place. Going forward, baby boomers have significant motivation to spend on home improvements. They also have the financial resources to do so. By staying in the workforce longer, baby boomers often have sufficient incomes to undertake these improvements. 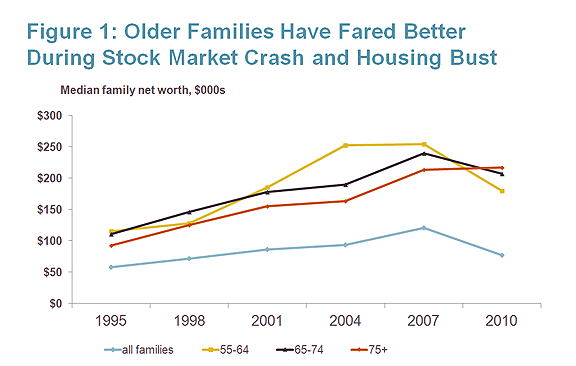 Moreover, because older households were able to benefit from the run-up in stock prices and home values more than younger households, they typically have seen greater gains in wealth. 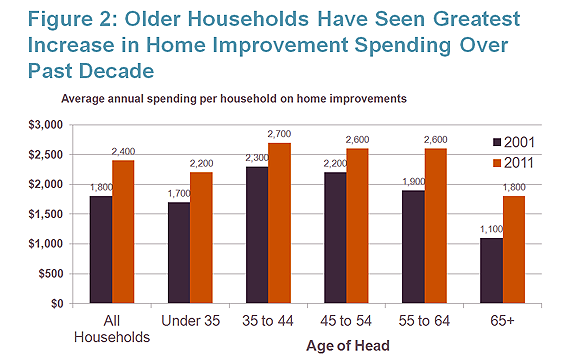 The net result is that home improvement expenditures by older owners have grown faster than for younger ones. As their longevity has increased, coupled with their uncertainty over future economic conditions, seniors have been more inclined than comparable groups in prior decades to remain in the labor force. The labor force participation rate (the share of the population that is working or actively looking for work) for the age 55 plus population increased from 30.1% in 1990 to 40.2% in 2010 according to the U.S. Department of Labor. They project that it will continue to inch up for this group in coming years. While incomes for older workers have held up better than those of their younger counterparts, the biggest difference has been in the wealth positions of these households. Older families, who were able to benefit from both the run-up in stock prices and home values, are generally in a much better financial position now than their younger counterparts. Between 1995 – when both the stock market and housing market began to accelerate – and 2010, median family net worth increased by almost 34%. However, it increased significantly more for older households, with families age 75 and older having a net worth 133% greater than their counterparts in 1995. Not only was the upside greater for older families over this period, but the recent downturn has been significantly milder. 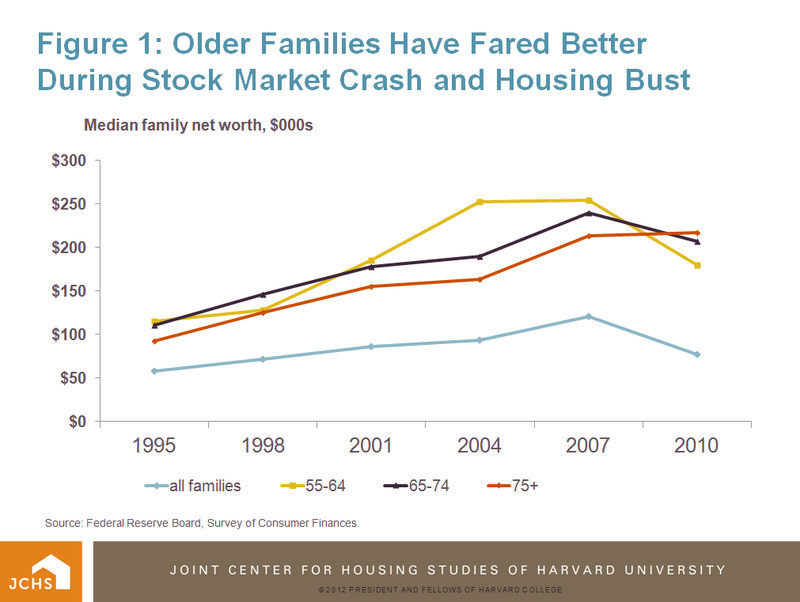 While median family net worth declined over 35% from 2007 – when both stock prices and home values were near their market peak – to 2010, it declined less than 30% for those aged 55 to 64, and even increased modestly for families aged 75+. Though families aged 55 to 64, the leading edge of the baby boom generation and therefore a key demographic to watch, haven’t done as well as older families in recent years in holding onto their net worth, their situation still looks promising. Typically more highly leveraged during the growth years, this leverage often worked against the leading edge baby boomers during the downturn. Still, by 2010, the median net worth of this group had increased more than 55% from 1995 levels, compared to 34% for all families. Coupled with incomes that have held up better than their younger counterparts since 1995, this leading edge of the baby boom generation is entering its retirement years in a generally comfortable financial position. 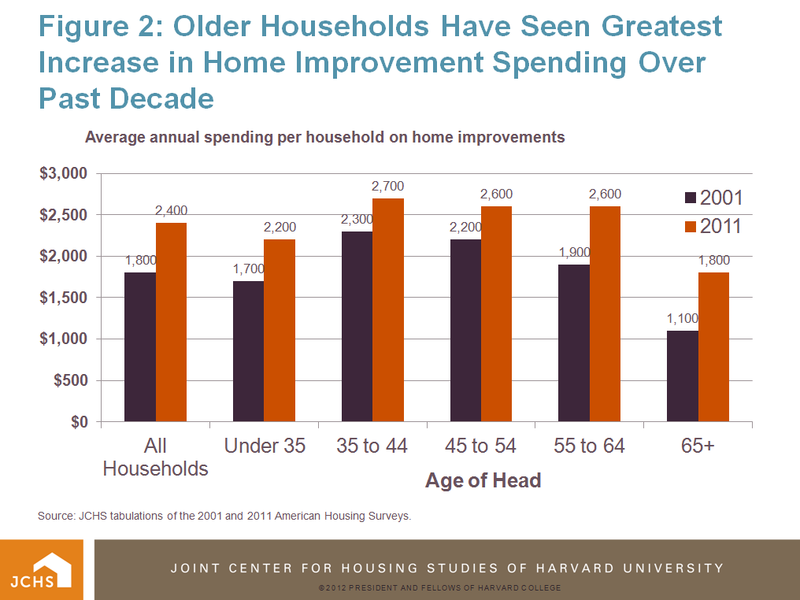 Greater longevity and lower mobility have given older households the incentive to improve and modify their homes so that they are able to comfortably and safely age in place. Higher incomes and greater wealth have given them the ability to do so. Average spending by homeowners on home improvement projects has increased about 30% over the past decade. However, while gains have been more modest for owners under age 55, they have increased by over 50% for those over age 55. The combination of greater numbers of baby boomers aging in place and greater per owner spending on home improvement projects has dramatically shifted the composition of the home improvement market. In 2001, owners age 55 or older accounted for less than 32% of home improvement spending in the owner-occupied residential market. By 2011, this had grown to 45%. So, while the influence of baby boomers on the new residential construction market may be waning, they are a growing force in home improvement activity. We need to update everything in our house, but I'd say the next project on our list is the kids' bathroom.